According to PWC the global sports market will be worth about $145 billion in 2015 and is growing faster than the global economy in general. Much of this value comes from fans eithier paying to attend events or view them on TV. Emerging technologies however are set to blurr the lines between attending and viewing events, with completely new ways of experiencing spectator sports. Attending events that take place over a wide physical area, such as golf and motor sports, can often result in spectators missing out on some of the most important action that is taking place. It is possible to miss out on iconic moments simply by being in the wrong part of the course or track. Spanish start-up Viuing wants to help, and has developed a lightweight, water resistant, portable television that can be ditributed at events and transmists all the action and analytics in real time. No need to worry about battery power, signal or delays. This represent something of a merging of traditional event attendance and TV viewing. However, completey new types of experiences are also on the horizon, being led by virtual reality technology. Stanford’s Virtual Human Interaction Lab has been exploring virtual reality as a way for fans to experience games from a courtside seat. STRIVR Labs was spun-out of the Lab in early 2015 to develop a virtual reality platform specifically for sports teams and is already being used by the Dallas Cowboys to help players to improve on-field decision-making by allowing them to create specific game situations. The technology is only a small step from allowing fans to experience the action in a similar fashion. There are already several exciting companies that are focused on virtual reality and the sports veiwing experience, such as NextVR, 3D-4U, LiveLike, and Virtually Live. Interacting with the action is also on the cards. 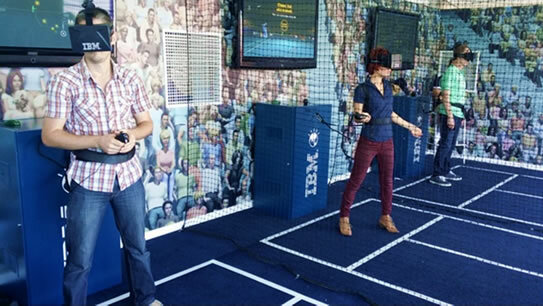 For example, during the Australian Open in 2014, fans were able to face a serve from one of the pros using IBM ReturnServe. It gave users the chance to try to return a live serve, and then provided stats to help them try again. Even deeper immersion into the action is also becoming possible by extending beyond audio-visual broadcasting. Buttkicker is an example of ‘haptic broadcasting’. Wireless accelerometers and sensors are placed at a sports event to capture live vibration and impact data which is added as a signal to the broadcast of the game. Although not visible or audible on viewers’ TVs, the Buttkicker kit is able to detect the signal and transforms it into impacts that viewers can feel through their couch. Taking sensor data from live events and using it to deliver similar experiences could also be extended to body worn sensors as well. For example, many top athletes and sports teams already train while wearing sensors, and it may not be long before body-worn sensors could be used to collect data during live events and broadcast directly to viewers. Imagine being able to feel the heartrate of your favourite player at a crucial moment in the game, or sense when they are becoming fatigued. This level of interaction can also go in the opposite direction as well, with fans sending back information. The possibility of infuencing the action is also becoming more feasible, and could open up new avenues for fan engagement. The FIA Formula E Championship already allows TV viewers to vote for which motor racing drivers they would like to receive an extra speed boost during the race. While this type of feature could be viewed as undermining the integrity of some events, similar examples of live, impactful engagement are likely to become more widespread. For example when the government of Tunisia banned public gatherings the fans of football team C.S. Hammam-Lif created ‘The 12th Man’ app to allow supporters to remotely cheer on their team. The system involved connecting 40 large speakers in the stadium to relay sounds in real-time from the mobile app. By using the app while they watched the game, fans were able to send various commands, such as shout, applause, drums, horn, and sing. The more icons they tapped, the louder the stadium became. With so many emerging technologies blurring the boundaries between attending, viewing and participating in the action there is an exciting future for sports fans to look forward to.